Tara Smith at A Teaching Life hosts our Poetry Friday this week. Thanks to her we have a beautiful description of snow, although the forecast for all of you in the east calls for more than what May Sarton describes. I hope you all stay warm and safe. It's always a pleasure to see what guest is visiting Today's Little Ditty and Michelle H. Barnes so we can learn more about them, and to see what the challenge for writing is for the month. This time, Douglas Florian visited, with a challenge to write about "nothing". You can read the post here if you haven't read it. Already several poets have written marvelous responses to this challenge. Be sure to visit Michelle often! Here is my response, ready for your weekend. So What Are You Doing This Weekend? Nothing, but. . .
And thank you! Those little things that mean "something" are important, aren't they? Love the somethings you're out to find: inside fun, outside activities and then in for tea and toast beside the fire. Sounds like a delightful weekend of Nothing, but . . . Enjoy every moment! Thanks, Ramona. The weekend won't be empty, that's for sure. Lovely talking last evening! Your weekends sounds most inviting. I like the way your poem picks up on the sounds - especially that 'crunching'! Thanks, a "crunch" in the snow is most satisfying. Like those cartwheeling minutes, Linda! What a fun way to describe time passing. Your verb choices are engaging. Enjoy your weekend! Thanks, Tabatha. I hope you'll have a good weekend too, perhaps "cartwheeling" somewhere? This poem is such a wonderful reflection of the you I admire, always looking for the something in the nothing. Thanks for sharing. You're welcome, Margaret. Life is filled with lovely little things. Love the upbeat tone and optimism in your poem, all those wonderful action verbs and that tea and toast. Great last line!! Thanks, Jama, happy you enjoyed the poem. Thinking of you as that storm heads your way! If anyone can capture something from nothing, it's you, Linda! 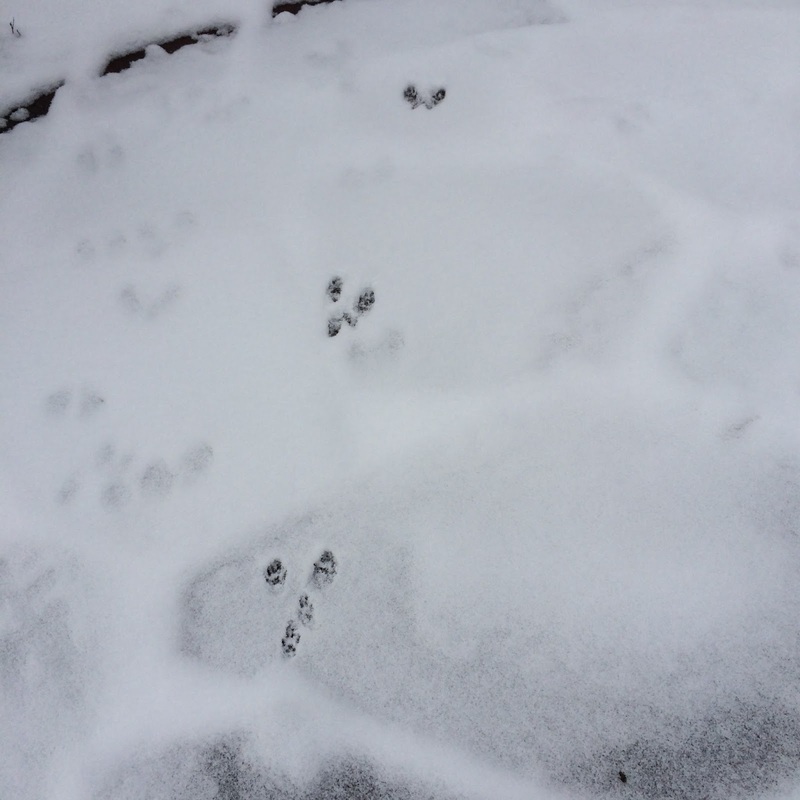 Thank you for sharing your poem and that sweet photo of the rabbit tracks too. (I examined it closely for evidence of chewed wires, but thankfully, no.) It's always a pleasure seeing what you come up with for these challenges! Thanks, Michelle. I haven't heard anyone say anything more about the wire cheering, & I have kept them out of my car too! Now it's simple fun to see the tracks! Verby, verby! Very verby! What a great action-packed poem of nothing! It is really something! And what precious little rabbit tracks! Thanks, Donna, action out of "nothing" is the plan! Of course, today, unlike the east, we have nearly 60 degree weather, no snow. But when we do I will follow where they go (usually under a bush!). You're always invited, Bridget! Thanks! Delightful poem, Linda! Looks like you'll have plenty of somethings to find this weekend! Indeed I will. The only change is we have no snow, except in the mountains! It's supposed to be in the fifties today & tomorrow! Thanks, Iza. You enjoy my favorite kind of somethings! I raise my teacup to you! Cheers right back, Keri. So glad you enjoyed them. Something from nothing....that's why we write, yes? Love the line, "cartwheel through the minutes." Nice! Thanks, Buffy, that "something" from "nothing" is what I like best too. Wonderful and cheery, Linda! I was only around you for a little while in Denver this past fall, but I would say this fits your sunny, warm personality perfectly! I love it! What a nice thing to say, Penny. Thank you. Yes, I'm usually pretty cheery. Life is too short to be grumpy. Loved the poem, my friend,but especially the closing lines. Yes! I like "snuggles into book inspiring." Wonderful poem for a winter day. Thanks, Joy, one of my favorite things! Linda, this is such a wonderful, upbeat poem from a positive mindset. I'm thinking that your action, crunching the deepening snow, may be fun tomorrow. A nothing type of something day sounds like a restful one. I can see you enjoying your tea and toast at the end of your day. Thanks, Carol. AndI imagine all of you in the east crunching that snow. We won't have any! I admire the way you always manage to make "something" out of "nothing. You have reminded me twice this week how important that is! And I love how you made the rhyme work! That's not easy! Thanks, Carol. Sometimes the rhyme comes and sometimes not. Hope you find a few bits of "nothing" this weekend! here is how the day will flow:"
Thanks, Heidi, the poem challenge was lots of fun to respond to. We seem to have been on the same wavelength with our poems this week, finding something in nothing. Your day full of somethings sounds lovely, Linda. Enjoy! Thanks, Catherine, I agree about the similarities in our poems. Hope you're warm & cozy back east! Thanks, Fats. Congratulations on your new job although I imagine it is tiring. Glad you'll find those 'somethings' to re-fuel! "Nothing's all a state of mind" - I like that! Writing about nothing is such an interesting challenge. Each poem I've read adds a little bit of something to pot. I've enjoyed the varied responses so much, Violet. Glad you have too. Very contemplative poem, Linda - and that last line says it all! Glad you made it through the weekend! And it was a good and warm one, Matt. No snow here. Hope you're doing great, too. Thanks!